Over 200 students, educators, professionals, and city and regional leaders attended the Y-PLAN Resilient by Design Youth Challenge Regional Summit two weeks ago at UC Berkeley. 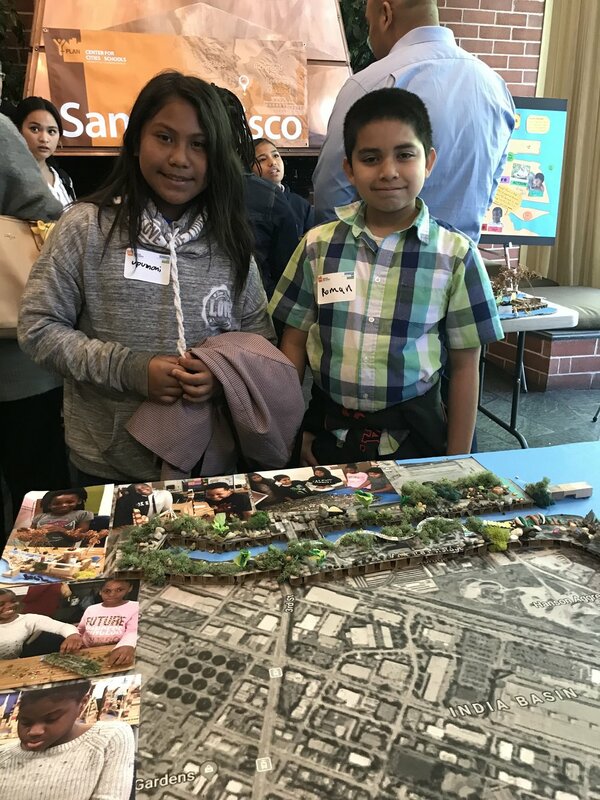 High school students from Oakland, Richmond, and East Palo Alto as well as elementary school students from San Francisco shared their design proposals and inspiring visions for a more climate resilient Bay Area. Students made their case through poster sessions + lightning round 1-minute pitches + showcasing models of resilient shorelines - we heard about floating housing, increasing parks and grocery stores, and new resilient housing for the homeless. Thank you to the 800+ students from around the region who participated in the Youth Challenge - you remind us that planning for a more climate resilient Bay Area must mean planning for and with young people. Check out photos from the event and KPIX’s TV coverage on the Youth Challenge Regional Summit! Resilient by Design and Y-PLAN were honored to have received recognition for the Youth Challenge from the UC Berkeley Chancellor's Awards for Public Service - read more here. We got a chance to interview a few students during the Regional Summit and ask them to respond to the following questions? -What does it mean to be resilient? -What was your favorite moment of the Youth Challenge? -What are you most proud of from the Youth Challenge? -Why is it important for young people to plan for a resilient future? -What can you do to stay involved and contribute to a more resilient future? Cota - It means being persistent and not giving up… to find a route to overcome whatever challenge it is. Jasmine - It means to bounce back from damage or disaster and adapt to changes. Whatever you are doing you succeed in. Jasmine - To me it’s about overcoming things and thinking things through if something does come up. Cota - Going to school where it’s not the best education... I had to adapt to challenges... I want change but not to gentrify my community. I’ve overcome a lot and still am to this day. What are you most proud of from the Youth Challenge? Jasmine - Not into it at first, why are they having us do their job for them. Did the team do this to get more ideas, do these people even live in these areas, they don’t experience what we live everyday. But I want to live here when I get older. I don’t want it to be the same - full of trash and bumpy roads. If you go to other cities like El Cerrito and Palo Alto you can tell the difference - it’s cleaner and nicer. West and East Oakland aren’t ugly but not new, not clean. When you are outside of Oakland, people think “she’s from Oakland, that’s bad.” It’s a negative reaction just because you from where you are from. Cota - Young people have bigger imagination and be creative, older people can take those ideas and build on them to make them more realistic. Young people are thoughtful. Their words can make people pay more attention and are more powerful in this situation [with climate change]. More people should listen. Jasmine - Some young people want a better city for their families. Living here is where people feel comfortable. What does it feel like to be resilient? Ramon - It feels like I am included in something. What’s a skill you can share with others? Ramon - I am good at different outside activities. Ramon - Doing the bushes on the [Islais Creek] model. Upumoni - We built the model and we had a lot of fun and we got to be here [at the Regional Summit]. Why is it important for young people to plan for a resilient future? Ramon - To protect the land and people from sea level rise. Upumoni - If you don’t plan, you don’t know what you’re going to do with your life. What can you do to stay involved? It’s how you bounce back from a struggle and keep going after repeated struggles and come out a better person with a better life. I try to prepare for everything. Preventative approaches are best - it’s good to think about consequences. Most people don’t know about these new models for combating homelessness. I’m proud to be a part of something bigger than myself. It helps prevent problems. We can think ahead and [identify] issues that you can improve. Young people are the future of this country. If we think of the best future, that would be ideal.